I'm sorry Nintendo, but I don't like you. Currently, Nintendo stand responsible for over 90% of the headaches I've experienced this month. And believe me, I'm not one to get headaches. That little £180 white box is currently pounding at some inner region of my brainal area, fueled by Christmas and maintained by annoyingly chirpy parents with their crumpled Christmas lists, written by their surprisingly demanding younglings. Playing Santa must be difficult, I sympathise, but, by goodness, being Santa's Little Helper should come with a few health warnings of its own. At this particular moment in time, during the frantic, in my opinion utterly pointless run up to the big Two-Five, one can't help but notice that the most pressing question on lips, down phonelines, and yes, even one of the most searched-for products on the Internet this week (at least, according to Spannerworks.com), is this alternative next-gen games console. You have to hand it to Nintendo, they've done a spanking grand job in hyping up their console to the high heavens for the second year running. 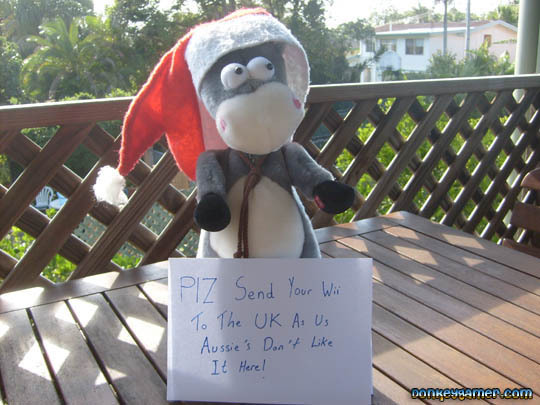 In fact, there's so much buzz that Nintendo have decided to pull their UK advertising. They're clever sods, and know fine well that not only is demand is far greater than current production can keep up with, but understand that announcing advert cuts to the media will result in even more media hype! Which will thus result in even more attention being generated toward the company. Honestly, if Nintendo were an average functioning human being fed humble pie, quite surely they would have burst at the seams by now. In retaliation, consumers are looking for alternative gadgetry to display under the tree, and most are pointing their purses in the direction of the hand-held Nintendo DS console, in order to sooth their heartbroken bairns during the Yule Tide season. And now even stocks of DS's are dwindling, with many shops displaying "Due to overwhelming demand.....no DS consoles are currently in stock" signs, to shoo the wild mass of general public from congregating, instigating protest marches, firebombing games stores, etc. I'm not really sure how much more I or my fellow co-workers can take of the constant and hopeless demand shown by the mass elite of Central Scotland. Queries like "I know this is a stupid question, but you wouldn't happen to have any Wii's in stock, would you? ", are asked at least fifty-four times on a daily basis. Rodger tries to help, in anyway he can. Now, come on general public; you've already done yourself a favour. If you think your question is likely to be stupid, most likely it is, and you should refrain from asking in the first place. Or, better still, offer me an aspirin first. Aside from a tight smile and mutterings of a thanks-you-are-of-absolutely-no-help-at-all demeanor, the next most common follow up to my generic response of "No, piss off" is usually "So...when do you think you'll have your next delivery? ", as if sudden sweet-talk will coax me into passing on phantom information which, by the way, I DON'T POSSES. The best response, I have found, is to smile sickly and chant "My psychic abilities aren't working today. Next please?" Not to sound overly mean - which I probably do - Christmas cheer and I appear to operate on completely different wavelengths. Not because I'm a wholly selfish sod, you understand (I am, but only partially), but because I simply find Christmas to be repetitive, a complete farce, a monotonous novelty-driven scheme in which retail fat-cats enter the bitter cliche, jacking up prices to staggering proportions, and emerging triumphant, patting their fat bulging wallets satisfyingly. Gone is the notion that an orange in your stalking is to be valued, and here arrives the twenty-first century arrogance of youth, which dictates that if little miss X and young mister Y do not receive their Slim and Lite PSP on the festive day, blood will boil, parents will anger, and huge huge trouble can - and indeed will - ensue. Unfortunately for myself and the rest of the hard-working individuals at game stores across the nation, most of this huge huge trouble is aimed squarely at us, the sales assistants. Stuff Call of Duty 4, we are the true front line, fighting for a bit of peace and quiet, defending nasty blows of verbal abuse and words of ignorance, pleading, and the occasional expletive. There's a lot more to be said about the state of society (but don't worry, I've almost finished). Most importantly, I would urge all you hard-working individuals to stop for a moment, and consider exactly why you shell out wads of hard-earned cash (or otherwise) on over-priced crap, most of which will either never see the light of day, or worse still, takes at least six AA batteries to even function in the first place. Advice like this coming from a twenty year old with a bad haircut may sound odd, but I believe that nowadays, in the midst of a generation of spoiled children and both retail and peer pressure, that maybe it's time to step back and take a look at the bigger picture. I wouldn't consider myself religious in any way, but I can recognise the basic fundamentals that Christmas once stood for: kindness, appreciation, a time to reflect and a time to look forward. Somewhere along the line, I think we got lost.